Dedication: "Courage is fear, when it has said its prayers." The USS Theurgy (NX-79854) was the prototype of the Theurgy-class of Federation starships launched in the 24th century. An experimental prototype, she was designed for long-range exploration, diplomacy, and deterrence - a Multivector Dreadnought. She was the ship that played a highly central role in the war against the parasites that had usurped the power from Starfleet Command, while she was commanded by Captain Jien Ives. 4.1 Vector 01 "The Helmet"
4.2 Vector 02 "The Sword"
4.3 Vector 03 "The Stallion"
4.4 Vector 01+02 "The Soldier"
4.5 Vector 02+03 "The Ranger"
6.4 Computer Systems and A.I. The Theurgy was built in a joint venture between the Antares Shipyards and Utopia Planitia Fleet Yards before being commissioned on October 9th, 2378. The USS Theurgy was one of the most advanced Starfleet vessels ever constructed and was meant to be the pinnacle of starship design, destined to carry the Federation into a new generation of exploration in the next century. 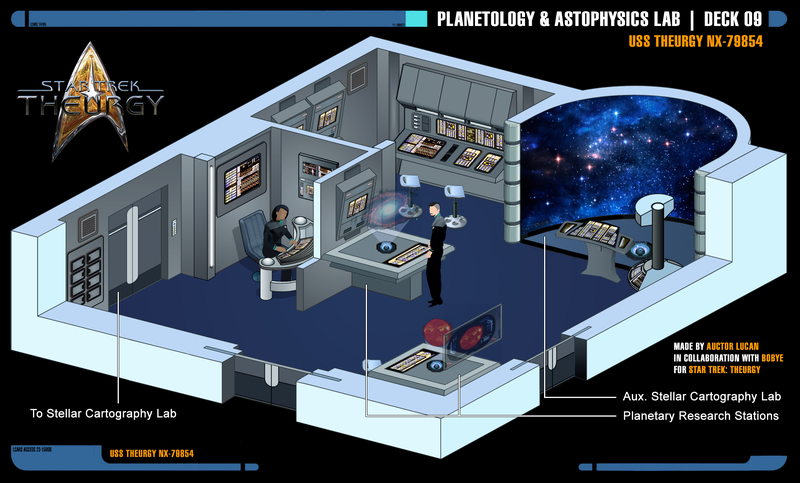 Devised to work far from a starbase or other Starfleet facilities, the Theurgy-class had expanded science laboratories and ample room for cargo or passengers. It was highly capable of rescue missions or civilian evacuations in war zones when taken to mass-production. Defensively, it had regenerative shielding, ablative armour, and multivector assault mode (MVAM) - in which the ship was able to attack enemies from three different directions simultaneously. It was one of the largest starships ever created by Starfleet, surpassing even the Odyssey-class in size. According to official Starfleet records, in early November 2380, after returning to base in San Francisco after a long diplomatic mission to Romulus, the senior staff of the USS Theurgy was involved in an attempt to overthrow Starfleet Command. Forced to leave Earth, Captain Jien Ives hijacked the Theurgy and defected, alongside his entire crew, to the Romulans. All attempts by Starfleet to apprehend the ship and its crew have thus far been unsuccessful. The whereabouts of the USS Theurgy are unknown at this time. The Theurgy-class shared similar design characteristics with the smaller Odyssey and Prometheus class starships. The design included three hull sections, each of which could be reversibly separated: an arrowhead-shaped primary hull, a detachable secondary hull equipped with a fighter bay, and a deployable tertiary hull housing the primary warp engines. All three sections were equipped with independent warp-capable flight and combat capabilities in the multi-vector assault mode (MVAM). While other starship classes had similar capabilities, such as the Galaxy-class with its saucer separation feature, generally the saucer section of such classes had no warp drive and limited weaponry. The Theurgy spent the vast majority of its life in Standard Operating Mode (SOM). Multivector Assault Mode - where the ship was divided into three parts - was typically reserved for battle situations. All hulls - or "Vectors" - were warp capable, and thus MVAM could be engaged during warp. Image: Symbiotic Tractor Docking. Click for animation. This Vector had the role of being the fortified command ship, housing the main bridge as well as the flag bridge. It also holds the main computer core, housing the positronic brain of the Ship A.I. In order to safeguard the senior staff and the admirals that might be on the flag bridge, the Symbiotic Tractor Docking procedure was implemented. The Vector's design was meant to accommodate for a docking procedure where the Vector could dock with any kind of Federation starship and escape battle. Of course it could also dock with Vector 03. The docking procedure would extend Vector 01's shields around the ship it docks with as well, and inside the ventral ring of the Vector, docking pylons would extend out to the ship's airlocks. The ventral tractor beam would adjust positioning to ensure that as many airlocks as possible could be opened. The nacelle on top of the saucer (which was actually two sets of warp coils in one nacelle frame) could remain extended if so required to augment the warp field of the lower ship. In short, even if Vector 02 would be destroyed in battle, the fortified command ship of Vector 01 could still retreat at a much higher warp speed than the saucer alone could generate. This vector had the Fighter Assault Bay and all the warp fighters as well as the pod launching platforms, giving it the nickname "the sword" since it was the Vector with the most "teeth". In short, it's role was to be a tactical strike carrier during battle. 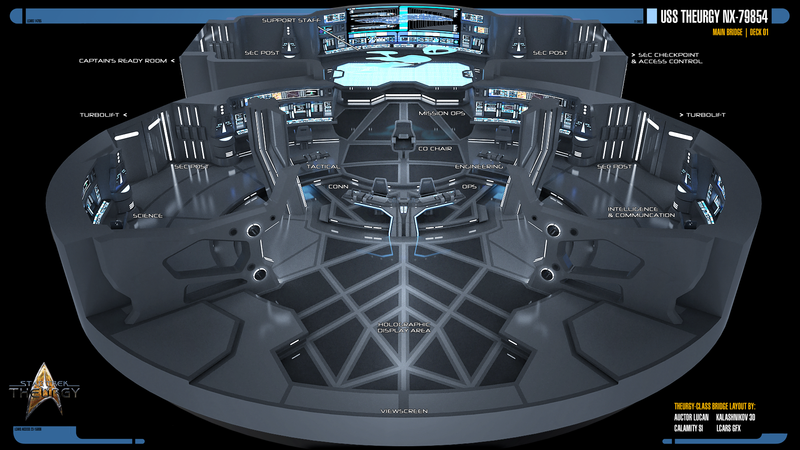 This is the stardrive section of the ship, which was the fastest one and it also housed the majority of all the crew quarters. While holding more than adequate tactical systems, it was primarily the fastest the three Vectors. With the most mass and interior space, this could also be considered the lifeboat of the three Vectors. This rarely utilised combination of the saucer section and the middle section of the Theurgy is called the Soldier, named thus in the event that the stardrive section - Vector 03 - functions as a lifeboat, leaving the other two Vectors merged for battle, perhaps covering the escape of Vector 03. This combination of the second and third sections of the Theurgy is called the Ranger, since it lacks the Helmet and yet has the best propulsion and fighting capabilities of the Theurgy. Diclaimer: Original 3D model by Calamity SI, with edits to the design by Auctor Lucan. The main bridge of the Theurgy-class was circular with an extended section to the rear and served as a nerve center of the vessel. At the rear of the Bridge was a large console and data readout screens. In the center of that area was the Master Systems Display, and this was where the support staff on the bridge worked. In front of the information center was a free standing holographic tactical display table which served as Missions Ops. The Missions Ops console was operated by either the Executive Officer, the Captain's Yeoman, or a member of the Operations Team. It was used to co-ordinate all activities within the current mission's parameters. It was usually where flight operations for the Theurgy’s compliment of Valkyrie fighters are organized. Starboard of the Captain’s chair were the stations of the Chief Tactical Officer and his staff. This area was maintained mostly for internal security and combat situations. Other systems that could be commanded by tactical included long- and short-range sensor arrays, sensor probes, message buoys, and tractor beams. An identical area was found on the port side of the bridge, which seated the Chief Engineer and his staff. Though the position was far better served in Main Engineering, situations arose where the engineer's presence was needed on the bridge. The console allowed complete control over all engineering and environmental systems. Forward of the rear bridge operation areas were doorways to the starboard and port turbolifts. The security checkpoint beyond the aft-port exit allowed security officers to screen those entering the bridge, either directly from Deck 01 or via Turbolifts, with the ability to redirect the latter as required. It also provided a defendable area and held an armory for handheld weapons. In the center of the Theurgy-class' bridge was the command area. Here, seating was provided for the vessel's Commanding Officer. In the armrests of the chair were miniaturized status displays. Using keyboard or vocal commands, the CO could use these controls to override the basic operation of the starship. Directly forward of and two steps lower than the central command area were the CONN and OPS stations. From there, the Flight Control Officer _ commonly called the CONN Officer - served as helmsman and navigator for the starship. Despite many of these functions being heavily automated, their critical nature demanded a humanoid officer to oversee these operations at all times. During spaceflight at impulse, CONN monitored relativistic effects as well as inertial damping system status. When the ship was traveling at warp speed, CONN monitored the subspace field geometry in parallel with the Engineering department. During warp flight, the CONN console continually updated long-range sensor data and made automatic course corrections to adjust for minor variations in the density of the interstellar medium. On the port side, the Operations station presented the Chief Operations Officer with a continually updated list of current major shipboard activities. This list permitted Ops to set priorities and allocate resources among current operations. This was especially critical when two or more requests required the use of the same equipment, entailed mutually exclusive mission profiles, or involved some unusual safety or tactical considerations. Flanked to the starboard side of CONN sat the Chief Science Officer and his aide. 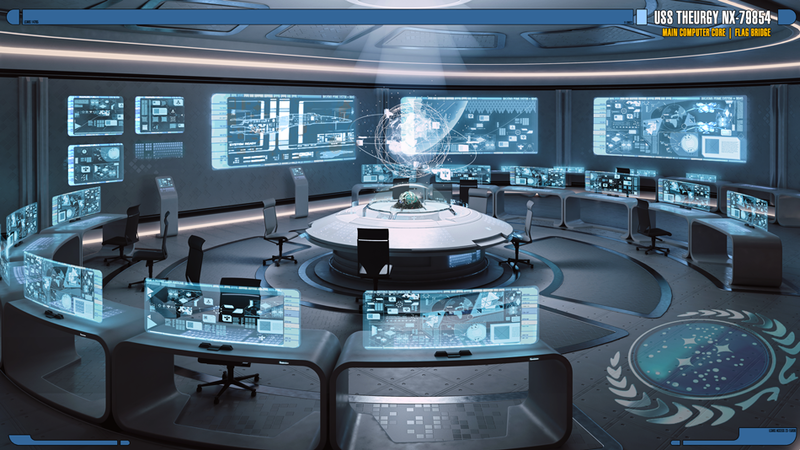 Two duty stations allowed the science staff direct access to data from the numerous science laboratories aboard Theurgy, as well as the deflector and sensor arrays. On the port side of Ops were duty stations for the ship's Intelligence detachment but on the USS Theurgy, the Communication Specialist - Selena Ravenholm - had her station here too. 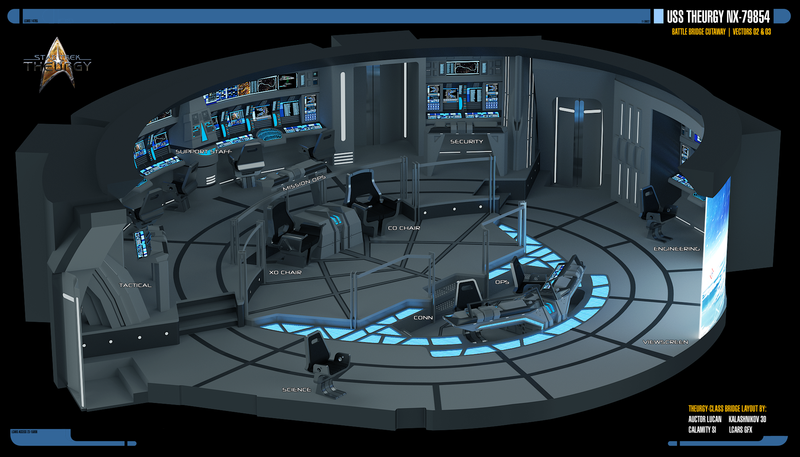 Based on Deck 8 in the Secondary Vector and Deck 11 in the Teritary Vector, the USS Theurgy has two battle bridges. These are smaller than the main bridge and are designed to operate independently as required when in Multi-Vector Assault Mode. 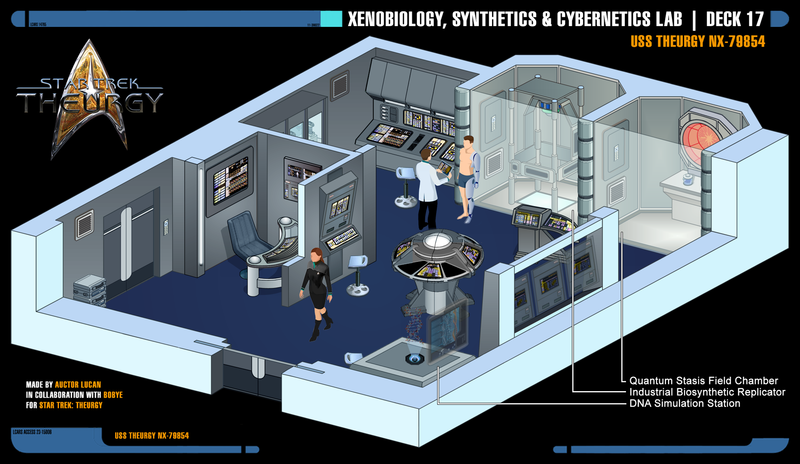 The computer system on board the Theurgy-class was a mixture of isolinear and bioneural based processing. Computer systems were concentrated in a computer core, which was accessible through a maintenance room. Each Theurgy-class vessel carried a total of four independent computer cores; one located in the primary vector, one in the secondary vector, and two in the tertiary vector. 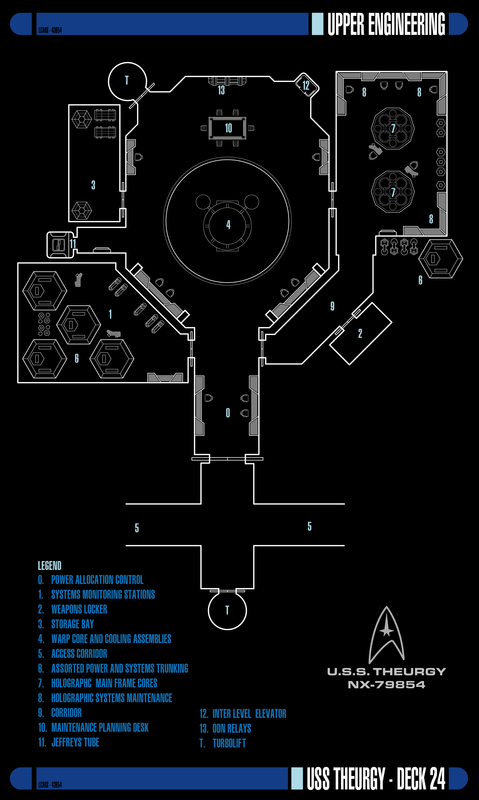 The top level of the Primary Computer core provided the space for the hardware of the vessel's A.I. An explanation for the hologram of the Theurgy’s A.I., which was much akin to the Doctor on the Voyager, but had hardware in the form of a Soong-Legacy prototype positronic brain core, housed in the Main Computer Core. After the USS Voyager returned to the Alpha Quadrant in the year 2378, and the EMH Mk.1 became renowned for its development from a mere emergency hologram to a sentient considered individual (even earning the publishing right to its own holonovel series), another - classified - old project of Starfleet earned a lot of new interest. Twenty-six years earlier, huge amounts of funding had begun in the development of a rudimentary idea involving a Ship A.I. and a side-project was the outline of a holographic interface for this A.I. The term 'artificial intelligence' (or computer intelligence) had always described prototype computer hardware and software sophisticated enough to reason independently, form new conclusions, and alter its own responses. By that time, the technology was no longer impossible. The idea was that while the A.I. would be limited in its accessibility to ship systems, it would still serve as well as any crew member - possessing first-hand knowledge about the vessel it was installed into. As time passed, the project caught the eye of non-scientists and became a political debate. While it was the Daystrom Institute's hope that the Ship A.I. would inspire an entirely new generation of artificial intelligences capable of far more than anyone could have previously imagined, many began to concern themselves with the independent nature of living artificial intelligences installed and adapting themselves aboard torpedo-carrying starships. While the developers thought that the benefits of making a starship an essential part of its crew far outweighed the possible negative scenarios, Starfleet as a whole could not reach consensus. The solution was a set-back for the A.I. development for the sake of preserving the comfortable safety of the common standard computer integrity. Besides the software programming, an extensive amount of hard-wiring had to be done to a starship in order to keep the software from being able to access certain key systems. Long and heated debates coursed over the matter of what an A.I. was supposed to be able to affect or not, and what manner of prerequisites were needed to alter the interface projection's accessibility and actions. Moreover, the projection itself needed "physical" accessibility to the whole ship, and therefore required a huge amount of holo-emitters on all decks. Subroutines would often account for the sentient qualities of A.I. and this debated Ship A.I. project was no exception. Subroutine C-47 was and still is a section of the software in each Starship's computer responsible for non-critical systems such as replicator selections and recreational programming, all of which had to function without hampering the sentience of the interactive projection. An activation subroutine also needed to be ironed out; a standard set of procedures that were required to be followed prior to the summoning of the projection. Furthermore, a modesty subroutine was added in response to the evident fact that the hologram would not feel it was necessary to wear clothing because it would neither suffer from the elements nor leave its own "body/ship" so to speak. Suffice to say, the magnitude of the project escalated every day. The subroutines piled up, and added with the millions of other functions of the starship itself, it seemed it would become too much data to handle. Though with the advancement in Android sciences at the Daystrom Institute, based on an advanced neural-net design of Noonien Soong and the technology of a pasitronic brain, the vague idea of a solution took form. This, however, was the point when the Dominion War broke out, and the enterprise was no more a priority. Yet with the aforementioned return of the USS Voyager, the project received its due attention once again, and the concept of incorporating a pasitronic brain into the main computer core of a starship was given its proper chance of implementation along with the evolving Prometheus project that was about to be finalized. Moreover, the Emergency Command Hologram (ECH) was an extension of the USS Voyager’s EHM and proves essential in the development process. The program was implemented by Captain Kathryn Janeway on Voyager and would serve as a 'backup captain' in the event of the current command crew being incapacitated. The ECH possessed information from all major Starfleet strategic and tactical databases and could incorporate them into its plans for controlling the ship. The Ship A.I. Interface Projection possess equal command subroutines. All the pieces of the puzzle had been uncovered, and with the blessing of Starfleet Command, results came fast. The USS Theurgy was one of the first ships to be commissioned, and it was picked for the Ship A.I. implementation. The Daystrom Institute installed the A.I. 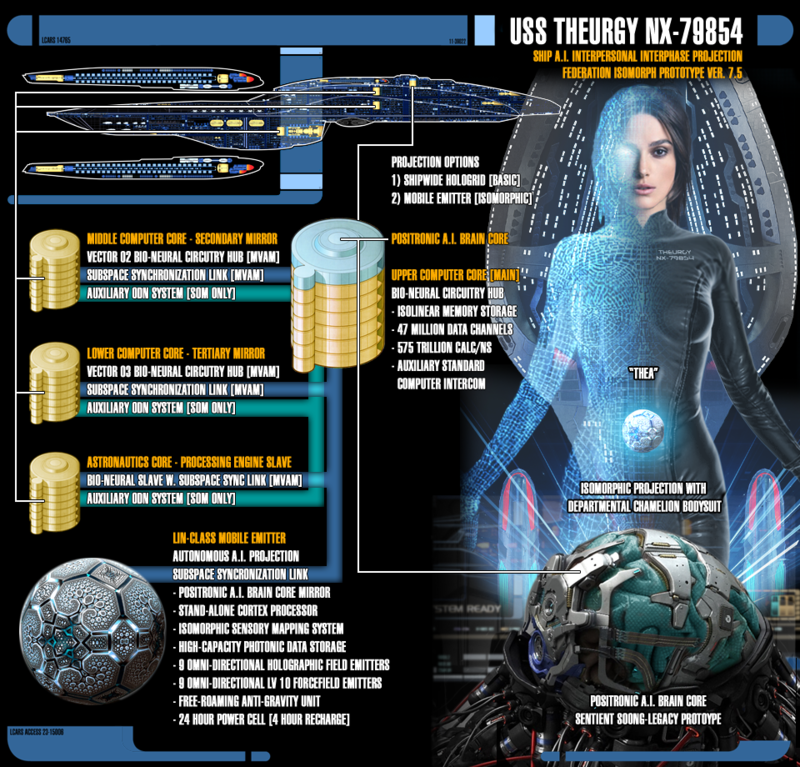 's primary matrix in the pasitronic brain within the computer core of the USS Thuergy itself. Without propulsion or tactical systems yet installed, the embryo that was the A.I. 's program could branch out and connect to every corner of the Theurgy’s mainframe. In the beginning, there were huge amounts of cascade failure - often occurring when a "learning" program was corrupted either by repeated application to a task it was ill-suited to perform or by external influence such as inferior hardware used to implement it. In a neural net system, essentially a positronic brain in which most or all sub-programs interacted, this led to corruption of surrounding algorithms and routines as they attempted to use data generated by the faulty application to perform a task of their own. Yet, in the end, the Daystrom Institute and hundreds of civilian programmers on the Federation's payroll managed it all with version 7.5. Their continued efforts with the stabilized version gained great results, increasing overall efficiency, but also helping the A.I. to develop more of a personality. The result was Thea, as she began to call herself instead of Theurgy NX-79854. She was a woman who had the benefit of the complete attention of the fleet's finest Counselors in order for her to come to terms with her existence. Throughout the years 2378 and 2379, she evolved from a simple yet highly dynamic ship's artificial intelligence into what came to be seen as the Theurgy’s personality and guardian spirit. In terms of functionality, she was flawless - tested and re-tested in all kinds of battle and non-battle situations. The Federation would never launch a prototype starship with an A.I. installed unless it had been thoroughly tested, after all. Early in the year 2381, Holographic Specialist Lin Kae developed a mobile emitter for Thea, with superior sensory mapping. It gave her the ability to leave "herself" and go on away missions. The Main Computer Core, which housed Thea's positronic brain core, and also served as a Flag Bridge as required. A flag bridge is a dedicated facility to command a formation of ships, independent of the ship it's on. If the Theurgy had not been an outlaw ship, this was where admirals would work from at the front lines. The admirals would have their own "flag bridge crew" to manage the overall situation, from the ships' statuses and the overall space around them. They would be independent of Theurgy’s crew proper and not involved in her operation between sending directions from the admiral and receiving reports. When in standard operating mode, Theurgy-class ships achieved warp flight through four nacelles, each of which were made up of multiple pairs of warp coils. They were in turn powered by a warp core, which at the center provided energy through a matter-antimatter reaction. The assembly for such was housed in Main Engineering. Main Engineering aboard a Theurgy-class starship was located on deck 25. The room was constructed around a class 9 warp drive with a tricyclic input manifold. The core provided a maximum output of four thousand teradynes per second. The warp drive was designed to operate for up to three years before refueling. The reaction chamber was equipped with a compositor, which allowed recrystallization of dilithium. The warp drive allowed the ship a top sustainable cruise velocity of warp factor 9.995. The Intrepid-class also featured two secondary warp assemblies. The secondary warp assemblies were housed with the primary and secondary vector, and allowed each hull of the ship to enter warp independently in MVAM. During standard operation mode, these cores idled, providing additional power to subsystems across the vessel. The main engineering room featured three levels. 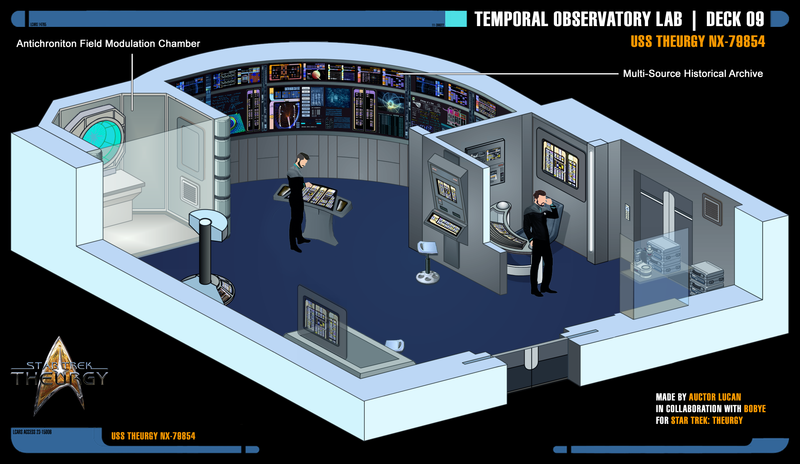 In front of the warp core was a large monitoring area on the lower engineering level. Also located on this level was the chief engineer's office and an open work area for special projects or situational analysis. The main impulse engines on an Therugy-class starship were located on the aft primary hull. Each of the pylons leading to the warp nacelles held auxiliary impulse engines. Theurgy-class starships were also equipped with auxiliary impulse reactors. The Theurgy had MVAM functionality, so this was one of the two auxiliary warp core areas, where the warp core was horizontal instead of vertical. The reaction chamber coukd be seen in the hole in the deck before the main console. Both auxiliary engineering areas were identical. In the event of a warp core breach, the Therugy-class starship could eject the warp core. This procedure required the authorization code of the chief engineer or a member of the senior staff. The core was ejected through the ejection port on the hull. Magnetic rails inside the channel accelerated the core once disengaged from the vessel and fired it away from the ship. Under normal circumstances, the vessel then moved away from the core as fast as possible under impulse power. Should the core not go critical, the vessel could recover it with tractor beams and reintegrate it with careful manipulation. A Theurgy-class starship housed over one hundred separate scientific research labs. Very few of the research labs remained under the same discipline of science for more than six months. Most shared the same design; only a few had extremely specialized equipment. 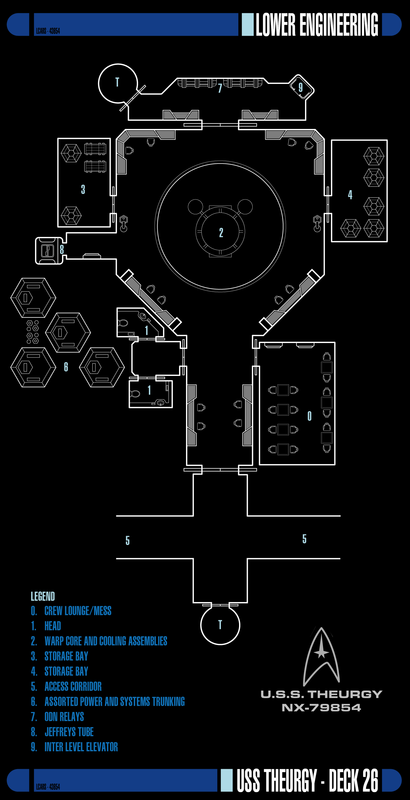 While most laboratories were shared, Theurgy-class vessels had specific stellar cartography facilities on Deck 15. Based in a large cylindrical room, the walls of the room were designed to be a three-dimensional display and spans two decks. 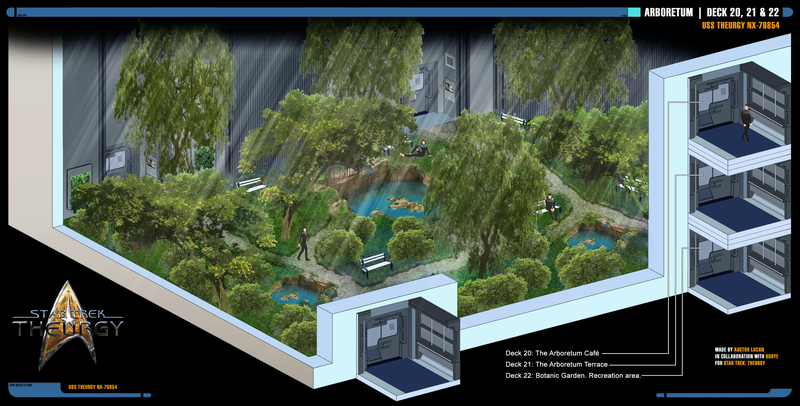 The arboretum was a triple deck room capable of studying and supporting a wide variety of plant life, and also doubled as a social area. The Theurgy-class utilized a ship-mounted pulse phaser array system. The pulse phaser arrays were similar to the Phaser Cannon assemblies on Defiant-class starships, but were tuned to allow an great arc of fire like conventional phaser beam emitters. Since the Dominion War, Starfleet had been seeking options for engagement in the traditional torpedo gunnery blind spots along a ship's sides, as well as ways to provide a heavy enough long-range punch at a rate that could effectively saturate a target's defenses, which would need to be a faster rate of launch than could be accomplished with individual torpedo tubes. As such, torpedo pods and their associated launchers were developed. As a result of this requirement, Starfleet Tactical R&D developed reusable pods carrying a number of torpedoes and an on-board power supply, launching mechanism, and computer and control system, which were fed their targeting information from the launching ship or as the capability became available, from Pod Control Modules (part of Starfleet's Palletized Systems Module, or PSM, program). However, despite the wish of some within Starfleet Tactical R&D, it was determined that using all-up main-tube torpedoes, or even the Mk XXVII Intermediate Torpedo, in the pods would be impractical. Indeed, the mass and volume of the larger warheads would prove unmanageable within the pods themselves as it would be impossible to mount linear accelerators large enough to reach meaningful launch velocities. Another deciding factor had to do with the limited magazine space within starships as there simply was not enough available internal volume to carry sufficient numbers of loose torpedoes to refill the pods with. As such, the pods were designed to house and launch 15 of the same Type V micro-torpedoes as carried internally in the Valkyrie-class fighter and the sheer volume of fire in each pod was deemed an acceptable trade-off for the much smaller individual warheads. But what made pods most attractive was that they did not necessarily have to be activated and fired as soon as they were launched. A ship could lay a pattern of pods and fire several of them at once (up to its maximum control capacity) into a massive salvo. And given pods' extremely stealthy nature in their low-powered standby mode and their lack of immediately apparent signature when being deployed, a vessel could even lay several patterns and either launch a number of massive salvos or maintain a steady stream of fire for an extended duration in "ripple fire", reallocating fire control and telemetry links to a fresh pod after one had been fired. However, only a pod-laying ship has the on-board facilities to quickly reload and recondition a pod for launch after recovery. On others, once a pod has been recovered, each tube must be individually reloaded and its covers replaced before the computer could be flashed and its battery replaced. However, pods were unarmoured and unshielded and, as such, were extremely vulnerable to enemy fire and collateral damage. When actively engaged, an officer commanding a pod-equipped ship had to decide whether he would rather risk laying a larger pattern with a heavier salvo at the risk of his pods being damaged or destroyed before he can fire them, or launching individual pods and flushing them immediately, sacrificing weight of fire for any given salvo for the knowledge that he will not lose any full pod to enemy fire or proximity damage. At this point in time, only a handful of ships in Starfleet are considered to be true pod-layers, with the Theurgy being the only one to have been intended from the keel-up with that particular capability. A few have been refitted to that status, and all of them have been attached to Admiral Sankolov for the time being. However, any starship can make use of them, keeping them internally in their shuttle bays or any external cargo hold with a large enough door to fit them. Or even having them attached to their outer hull using magnetic grapples, although such would change its hull profile, which in turn would affect the efficiency of its warp field and lower its maximum speed. Another disadvantage has to do with a pod's inherent fragility and should a hit come through and strike the pod, there is a chance the weapons may explode with catastrophic implication for the ship to which the pod is in contact with. Also, ships that have not been designed or refitted as pod-layers lack the telemetry capability to lay and control more than small patterns, the size of which is dependent on the ship's individual capabilities. That problem would eventually be alleviated with the issue of of Pod Control Modules, which were designed to give ships that were not designed or refitted to serve as purpose-intended pod launching platforms, yet expected to carry or control pods for a specific mission, the capability to control salvos of meaningful weight. Each PCM could control up to 18 pods at a time. However, such modules were unavailable when the intended test bed platform, the USS Theurgy, was commissioned and the alternate test bed, the Archeron, was deployed before they could be sent. However, there were four such pallets forward-deployed to a classified location near the Romulan Neutral Zone. Alternatively, a dedicated pod-launching vessel could fire the pods directly from its launchers and the empty pod would be flushed into space for later recovery. The trade-off to the higher rate of fire achieved was a lesser salvo weight. Another alternative, depending on the tactical situation, was for the crew that manned the broadside launcher arrays to keep the pods in place, close the array, and restock the pods inside the ship, but would entail two minutes of reloading for each pod. 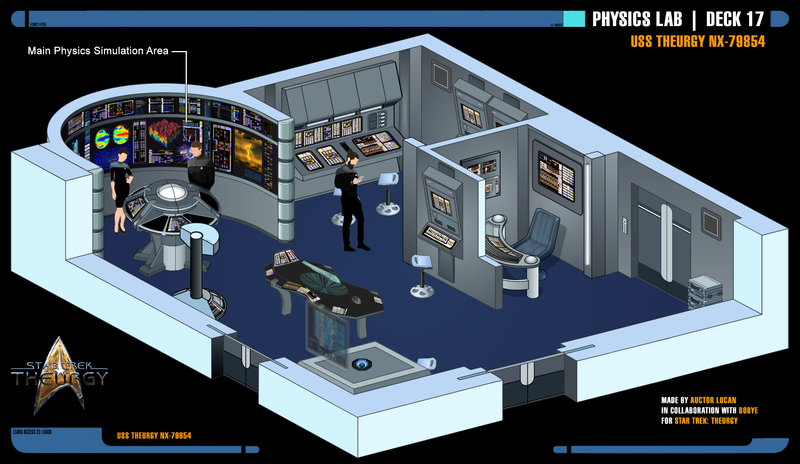 Image: Main Sickbay on Deck 11. 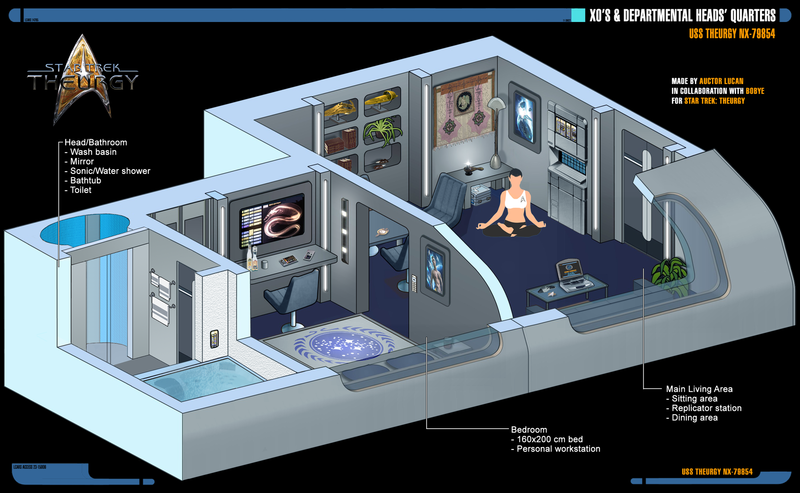 Image: One of the two Battle Sickbays on Decks 07 and 15. Sickbay is an old Navy term for "ship's hospital", which continued even into the 24th Century. 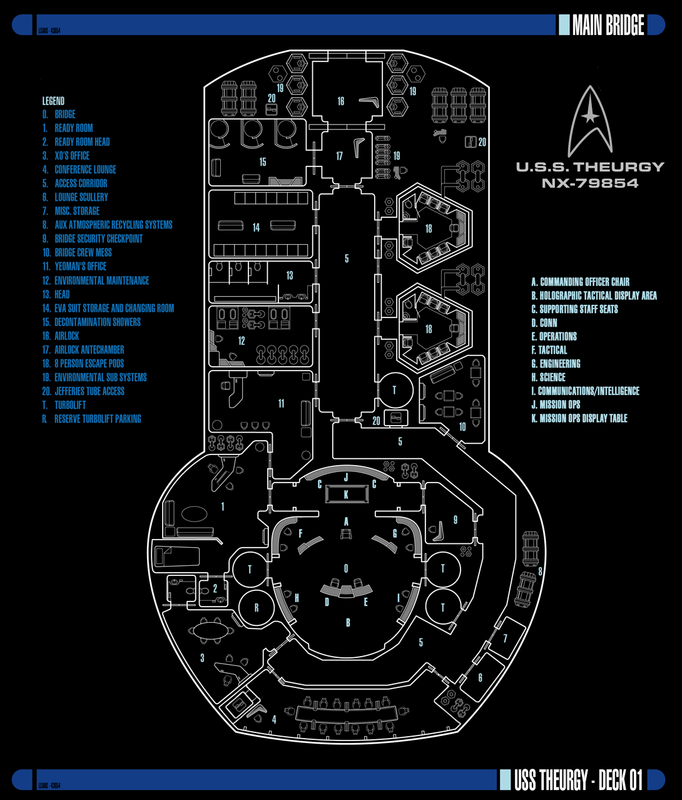 Here we will discuss the various parts of the USS Theurgy Sickbay. Pretty much where you'd end up if your illness or injury was not too life-threatening but the doctor required you to hang around overnight for treatment and/or monitoring. Also, this was where non-critical patients were placed after surgery. 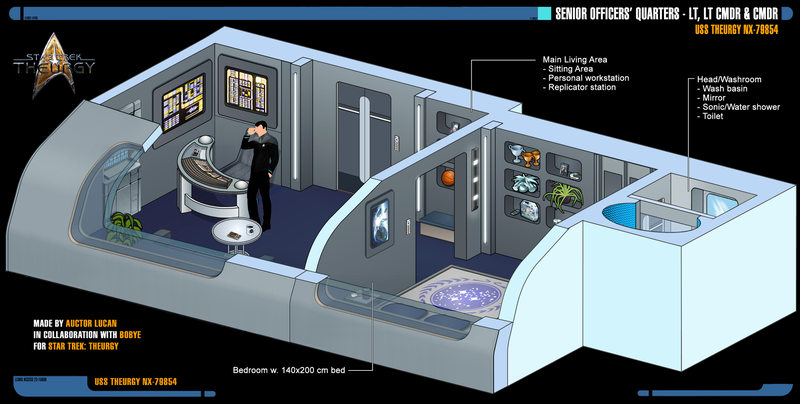 It included 12 biobeds with overhead monitors, sanitized pillows and sheets for each bed, one replicator, and a supply storage cabinet close by. This was where you'd be treated for bumps, bruises, common diseases, and anything else that didn't look to be particularly life-threatening. 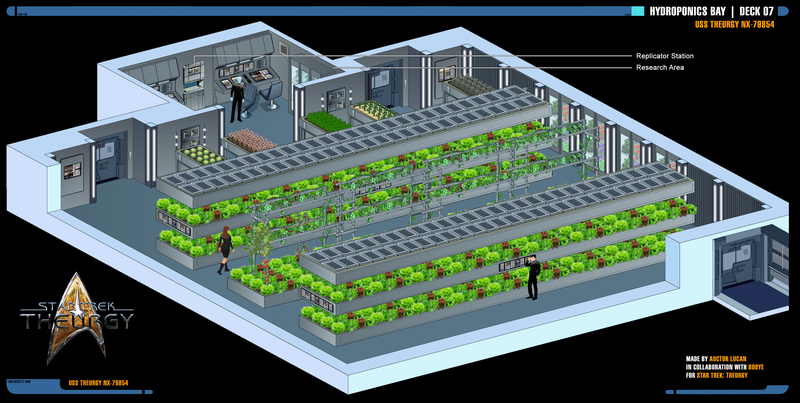 Included 12 scanning biobeds. This was where you would go if the doctors weren't sure whether you'd die soon or not and there was little more they can do about it but watch and wait. Each biobed was rigged for constant 3-dimensional scanning and monitoring of the patient. It included a computer link-up to an adjustable "Code Blue" alarm system that sounded the instant a patient's life-signs fell out of the acceptable parameters. 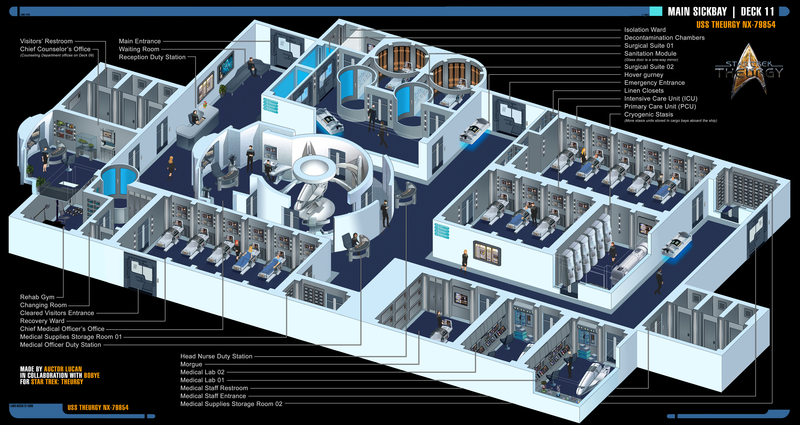 It also included one replicator, additional life support hardware for each bed, back-up battery power on a separate power grid from the ship, atmospheric isolation systems, and a supply storage closet nearby. If you needed surgery to save your life, correct an illness, fix a serious injury, or just have yourself cosmetically altered for an undercover assignment, this was where they'd have you laid out. 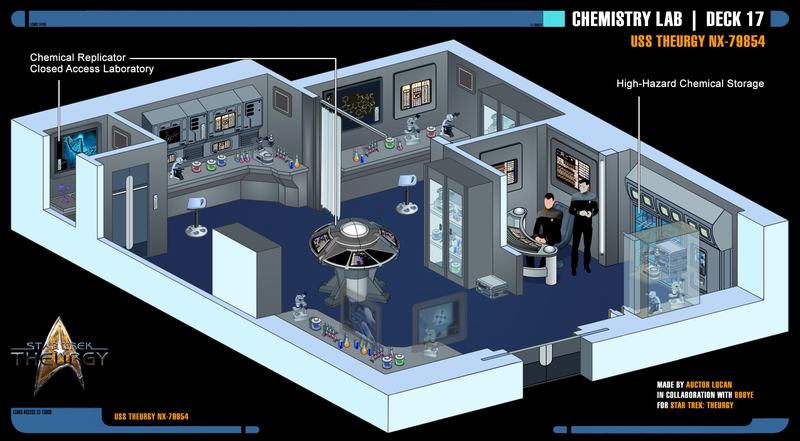 Along with the usual surgical tools, the room included mobile life support equipment, a replicator, atmospheric isolation systems, and scanning/monitoring readout station. Two EMH programs were available, the longer term Mark II and the short term Mark I. Developed to act as the Chief Medical Officer as and when required, these programs could also be activated to provide additional assistance to the real Chief Medical Officer. The EMH were programmed with all current medical knowledge and had the ability to learn as required. Additionally, the EMH could take on any other medical role as required by the ship/facility. Unlike previous EMH systems with primary emitters inset into the ceiling every 1.5 meters and larger back-up emitters inset into the center of each ceiling over the Recovery Ward, Primary Care Unit, Medlab-1, and both operating rooms being fully integrated with Sickbay's computer hardware to prevent accidental loss of the EMH at critical moments, the Theurgy-class took the EMH one step further, having holo-emitters in every area of the ship, allowing the good doctors to venture outside of Sickbay to treat the wounded more efficiently, just like the Ship's A.I. Hologram. 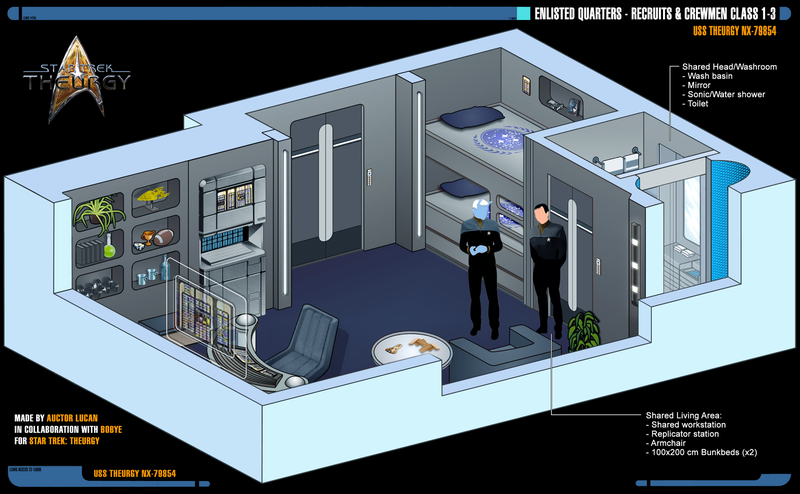 Because of the Theurgy’s MVAM-mode, many main areas of the ship were duplicated, this included the Sickbay. Vector 01 and 03 sections both contained a full Sickbay. 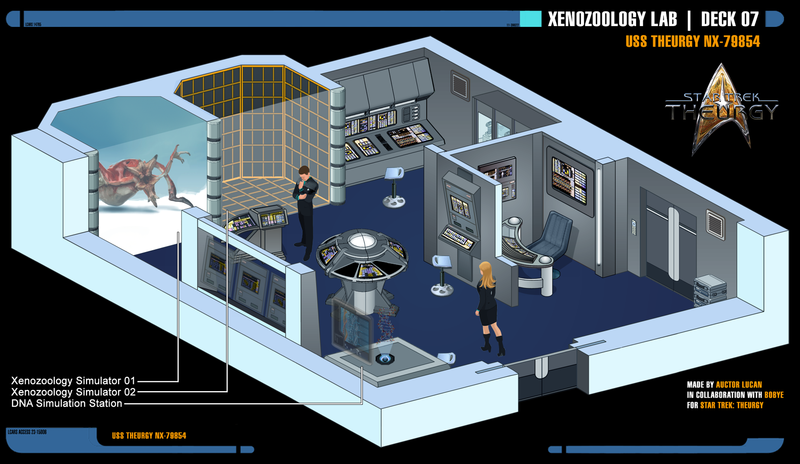 Vector 02's Sickbay (the saucer section) was the Main Sickbay area [discussed above], while the other two Vectors had one Battle Sickbay each. These were much larger than the Main Sickbay, and with its open layout that gave the medical personnel more freedom of movement, it was designed specifically for battle conditions. 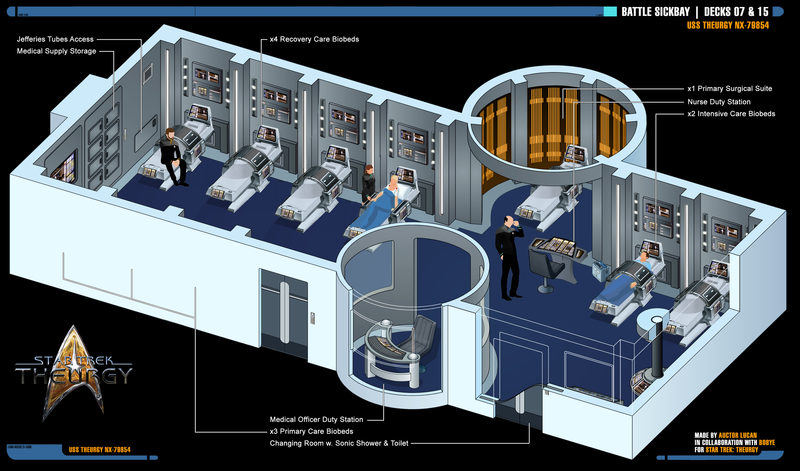 A morgue facility with storage slots for several bodies was located adjacent to the sickbay. 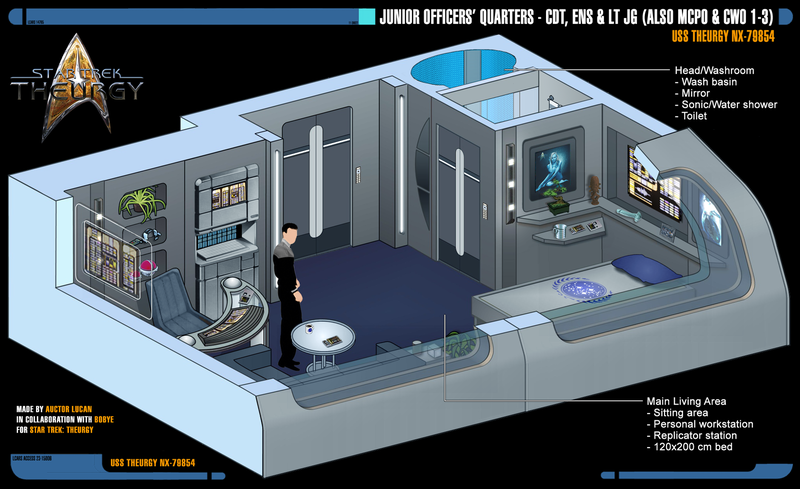 The Chief Counselor had their own office in Main Sickbay, on Deck 11. 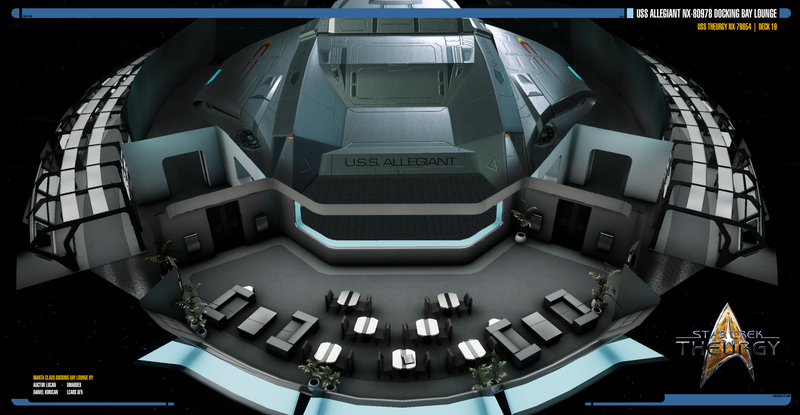 The majority of the crew members needing emotional support, however, could meet in private with the officers in the Theurgy´s Counseling Department on Deck 09. On Deck 09, there were several offices for the ship's rehabilitation needs. 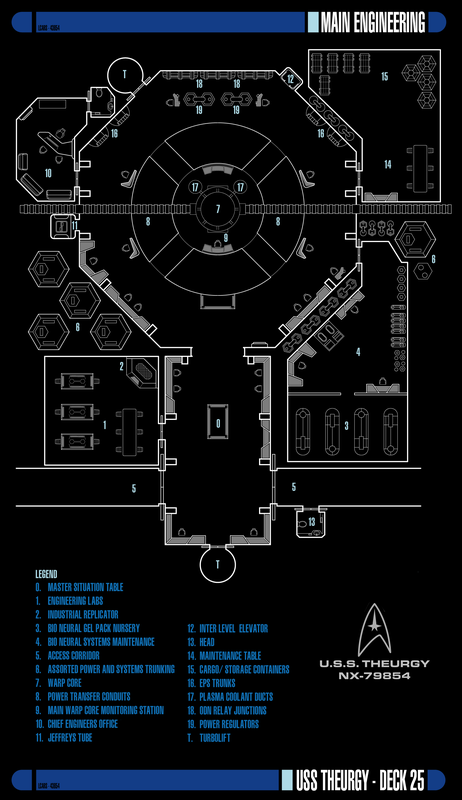 Most crew quarters on the Theurgy-class were located in the ship's saucer section, in order to provide safety for civilian and non-essential personnel during MVAM. However, the engineering hull also contained crew quarters, generally containing engineering personnel. 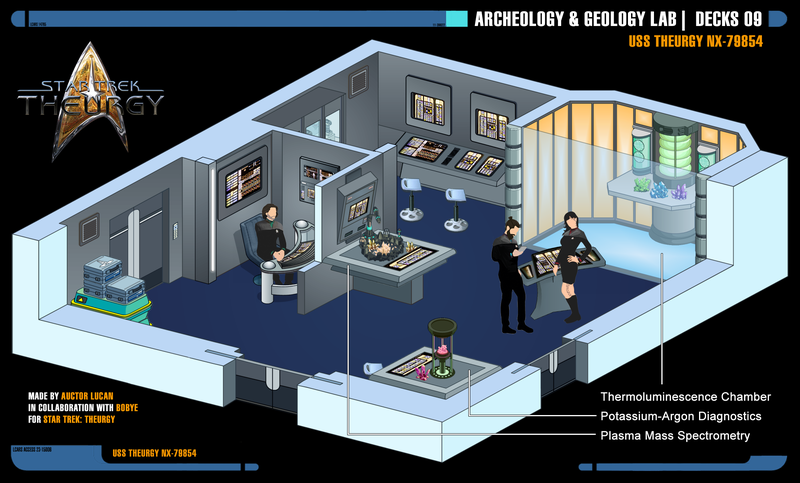 Located in the tertiary hull on Deck 28, Below Decks served as the social center of the ship. More info here: Below Decks. Informally known as “Fourteen Forward” the Spearhead Lounge had been popular with officers and visitors before the Theurgy fled Starfleet. Located in the primary hull on Deck 14, it is still a popular place for both officers and enlisted to dine and unwind. 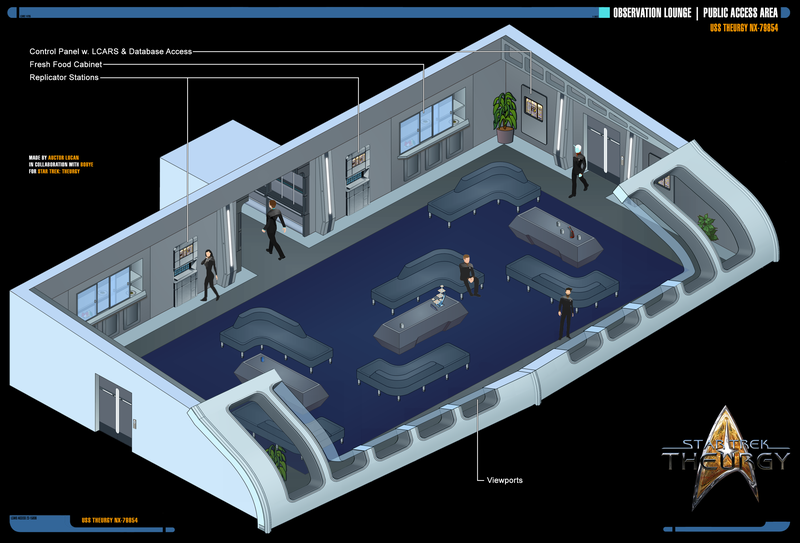 Located in the secondary hull on Deck 13, the Whetstone Lounge serves as the social center for officers and crew when the ship is separated into three stardrive vectors. There were eight holodecks aboard the ship. 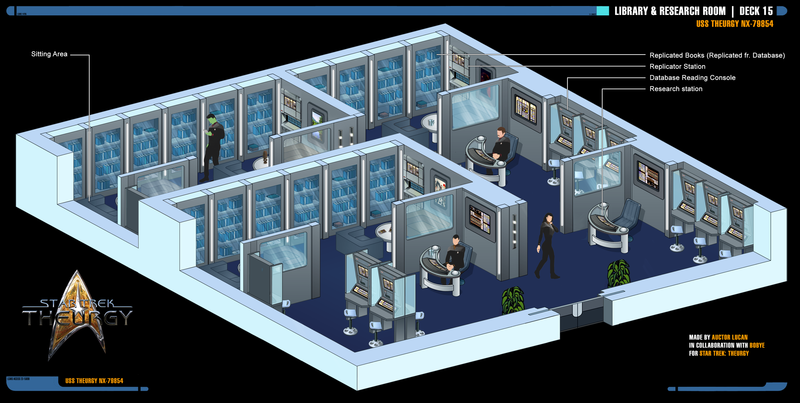 These holodecks were proprietary Federation technology and could comfortably support fifteen people at a time. The holodecks used a more efficient implementation of replicator technology to reduce power consumption when operational. This was achieved by using replicator technology to create static objects, which required no additional energy to maintain. Standard holo-emitter technology was used for dynamic objects. This allowed for continued use even when energy supplies were low, differing from those installed on earlier vessels, including the USS Enterprise-D, on which holodecks were automatically shut down when ships' energy dropped below safe levels. 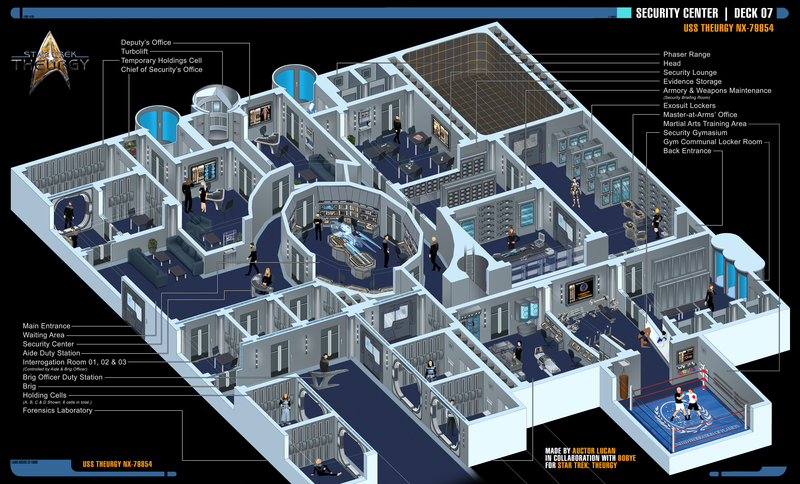 The phaser range was located on Deck 21. A person stood on a platform in the center of the room, illuminated only by the light which came from above the platform. Colored circular lights, approximately the size of a human hand, whirled across the walls, and the person aimed and fired at selected targets. After completing a round, the number of hits and misses, along with the accuracy percentage, were tallied by the ship's computer. There were at least fifteen levels of difficulty, and the range could be customized for two-player competition. The phaser range was also used by security officers to train personnel in marksmanship. 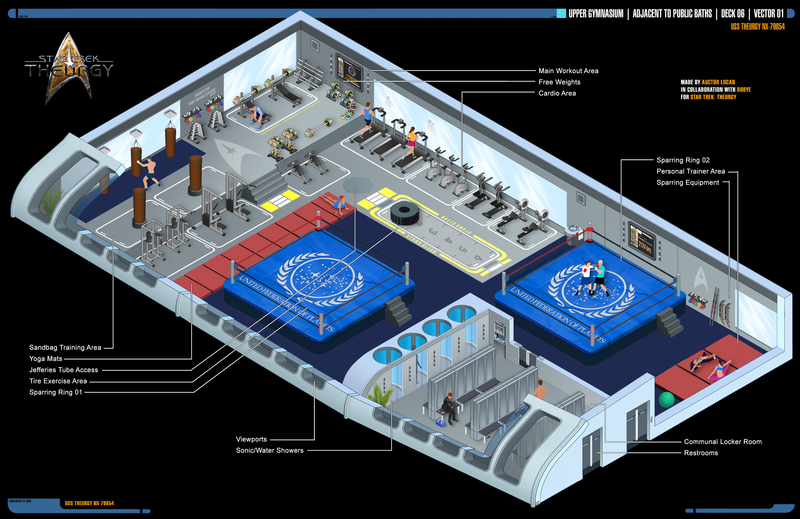 The gymnasium, which was also on Deck 06, contained a variety of recreational equipment for a variety of sports. In addition to aerobic studios and martial arts areas, there was a parrises squares area, a squash court, a fencing room, and an anbo-jytsu court. Even after the number of recent conflicts, Starfleet's use of combat-centric vessels such as the Defiant and Prometheus classes, remained a controversial issue. And even after the Prometheus-class project proved to be a viable option, purpose-designed warships remained unpopular and Starfleet looked for ways to keep ships intended for battle in service without diluting their tactical potential by stripping away capabilities. And, at the same time, Starfleet Tactical was seeking out ways to improve any vessel's combat potential without the need to build new hulls. And when both requirements collided, the Palletized System Modules (PSM) program was born. The concept was rather simple and quite similar to the plug-and-play capability enabled by USB ports in the early 21st century. A ship with PSM capability would have, under removable hull panels, universal connectors that would provide power and control linkages to to an standard-sized module which would provide additional capability to its host vessel. The installation process for any module was rather simple: the external hull panel was removed and then stowed into a cargo bay or other facility, and either with the use of an auxiliary craft or an EVA the module was brought to its location and was secured in place using maglocks and physical clamps. As it stands, only the Theurgy-class prototype was designed from the keel up for this capability, but several ships including the USS Archeron and a handful of vessels in her task force were refitted for it. While building a new class that was intended to receive this capability was fairly easy, the refit process required Starfleet engineers to readjust a ship's power budget, often involving changing its power plants altogether, in order to ensure every system could run properly. This was one reason that when she was first designed, critics referred to the Theurgy-class as being over-powered and over-engineered, despite the fact that her hull could accommodate up to X additional pallets between her three vectors. However, the PSM was intended to be a staple of future ship design, and theories surrounding the building of entirely modular starships were further explored on a continuing basis. The Theurgy-class featured transporter facilities which utilized bio-neural gel packs in their processor systems. 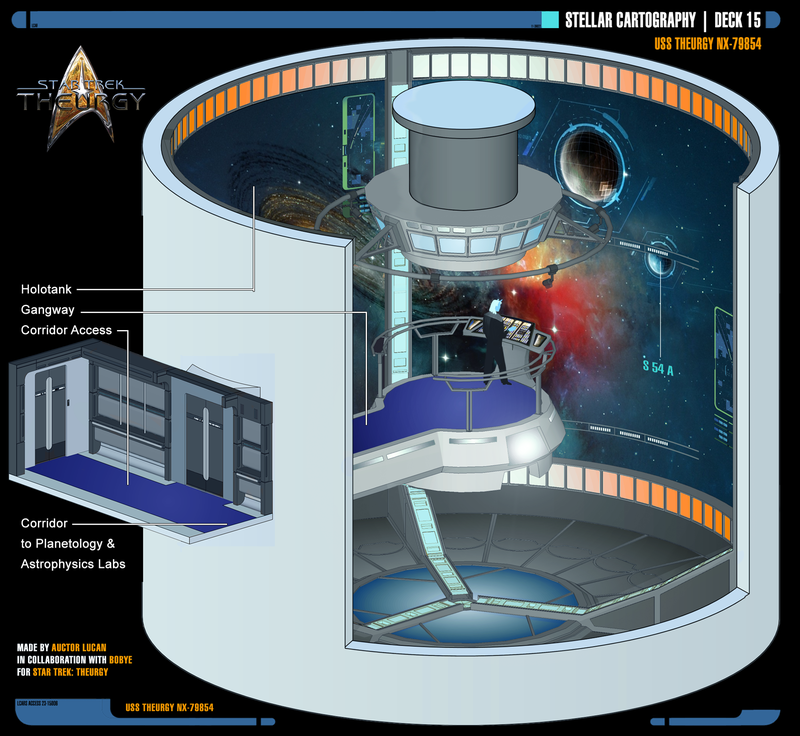 In case of emergencies, injured personnel could be directly transported to sickbay from anywhere in transporter range, including inside the ship. 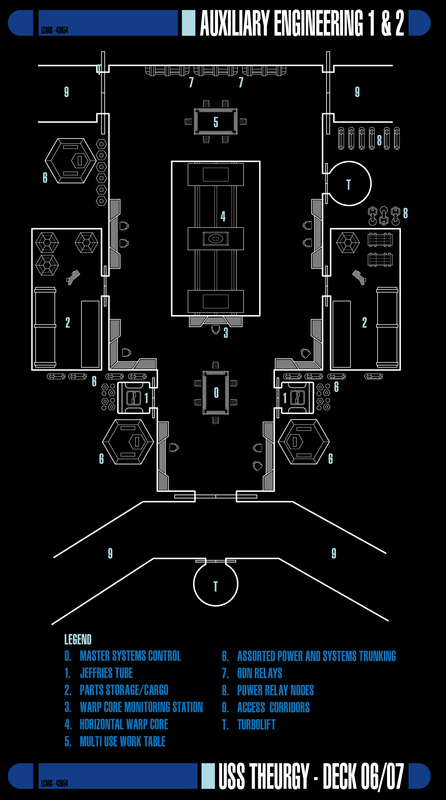 Like many Federation starships, the Theurgy-class' transporters had six standard pads located in front of a control console. 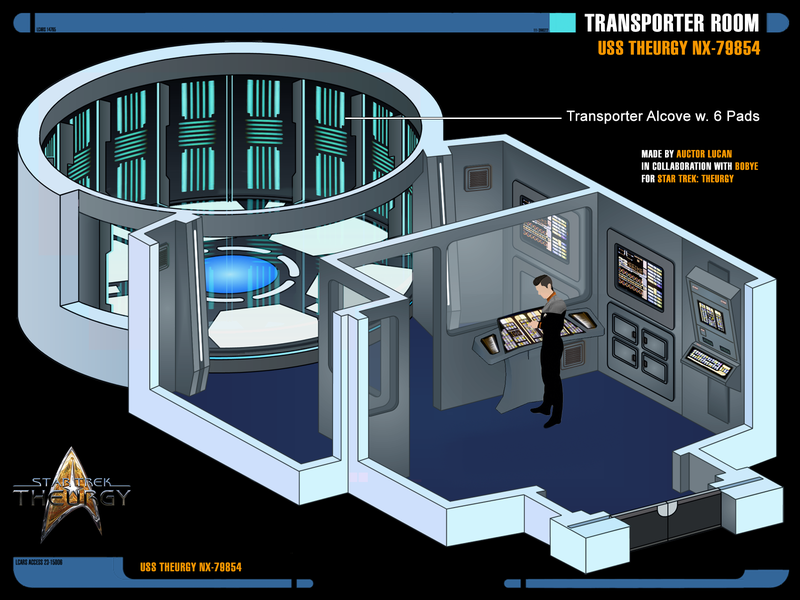 Here, the transporter controls were located in an elevated booth, and two officers could operate them in conjunction with a wall panel for more complicated transports. 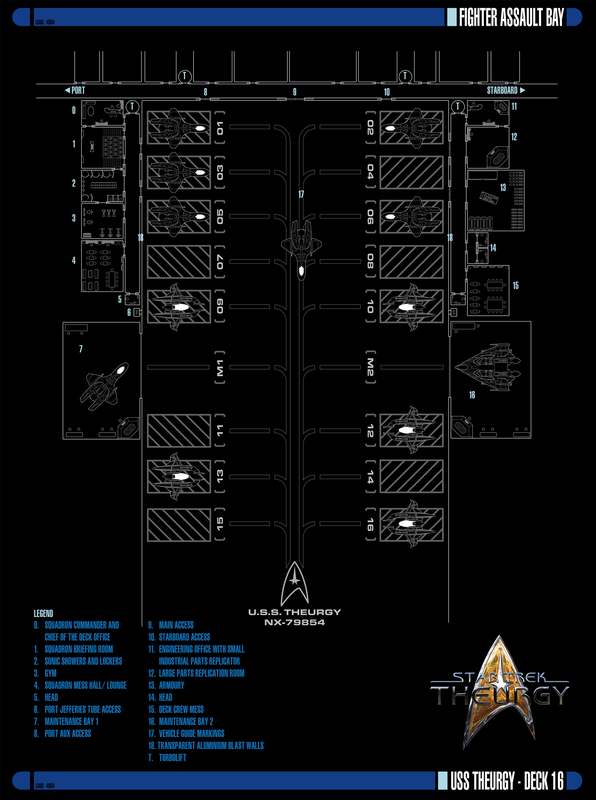 There were numerous multi-level cargo bays located all throughout the ship. 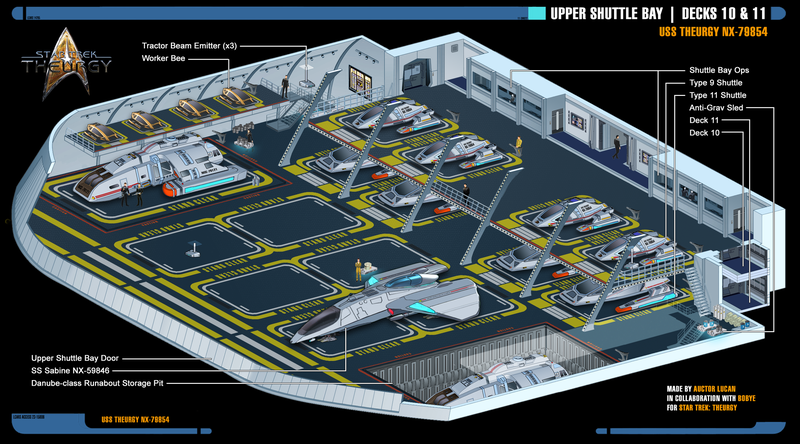 Most of these bays contained sufficient room for storage, cargo transporters, and anti-grav units for the transportation of cargo. There were two shuttlebays aboard a Theurgy-class starship, supporting many varieties of shuttlecraft. The main shuttlebay was located on Deck 11 in the primary hull. The Fighter Assault Bay (more commonly called the Flight Hangar, the hangar, etc.) was the area in which the Tactical CONN squadron of Mk III Valkyries were housed and where the Theurgy's fighter pilots usually hung out. The USS Allegiant NX-80978 - serving as both a scoutship and the Captain's Yacht - was located on Deck 19. Like many of the other things stationed on the USS Theurgy, was an experimental prototype. It was an augmented version of the Talon-class scout, only refereed to as Project Manta by the Advanced Starship Design Bureau, and embedded into the Theurgy’s hull as a Captain's Yacht. Theurgy-class "Into the Celestial Glare"